Join Karen Lund as she talks about Life is Good Being an Elder to Family & Friends in Episode 3. 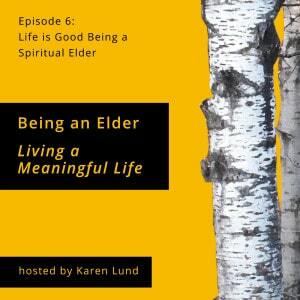 Join Karen Lund as she talks about Life is Good Being an Elder to Yourself in Episode 2. Karen Lund talks about Life is Good being an elder in Episode 1 of her podcast series, Being an Elder, Living a Meaningful Life.